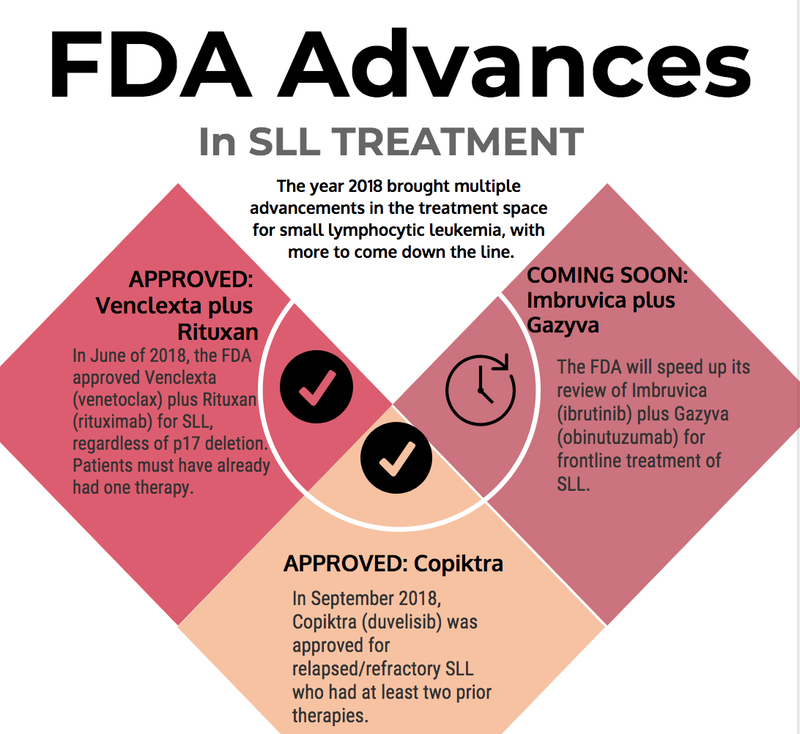 Take a look at the FDA’s decisions for the treatment of SLL that happened this year. Venclexta plus Rituxan. This combination was approved in June for patients with SLL – as well as chronic lymphocytic leukemia (CLL) – who have already had at least one other form of treatment. The drugs are given intravenously, and the combination is approved to treat patients regardless of whether or not they have a 17p deletion. Copiktra: In September, Copiktra (duvelisib) was granted FDA approval for patients with relapsed or refractory SLL or CLL who previously underwent two or more treatment options. Unlike Venclexta and Rituxan, Copiktra is given in pill form. Imbruvica plus Gazyva. The drug combination Imbruvica (ibrutinib) plus Gazyva (obinutizumab) was granted priority review in October, meaning that the FDA will review and potentially approve the regimen in six months instead of the usual 10. If approved, the duo will be used to treat patients in the frontline setting. Talk about this article with other patients, caregivers, and advocates in the Small Lymphocytic Lymphoma (SLL) CURE discussion group.